When playing for cash at online games, it goes without saying that we’re all wishing for as much good luck and fortune as possible. This is probably why the culture and scenery of China is such a popular theme for so many casinos. After all, this far eastern land is steeped in traditions and legends which celebrate fortune and prosperity. So, what could possibly be a better cause for celebration at Genting Casino than the Chinese New Year? 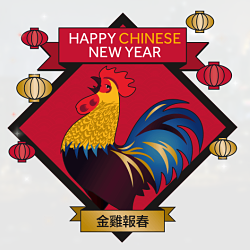 The site is seeing in the arrival of the year of the Rooster with a whole host of thrilling mystery prizes, available to all players. Genting is wishing each and every player good health, fortune and wealth this Chinese New Year, and to prove it, they are hiding mysterious surprise prizes around the site right up until February 16th. We can’t tell you exactly what to expect as all the rewards are being kept well under wraps. However, all of the fantastic offers will revolve around the Chinese lucky numbers; 2, 3, 6, 8 and 9. To grab these secretive gifts, all you have to do is sign up as a customer at Genting Casino and keep a close eye on your emails. Between January 23rd and February 16th, the site will be sending out messages detailing the promotional offers. Absolutely every registered member of Genting Casino is welcome to take part in the Chinese New Year promotion. It’s important to remember that the offers are only available through email, so make sure you use your correct and most up-to-date contact details when registering for the site. Some of the offers during this promotion may be subject to wagering requirements.